Het is officieel - in orde grootte 7 jaren is de wereld veranderd. Van email, Amazon en wat zoeken naar de complete tijd-en plaats onafhankelijke samenwerking van nu. 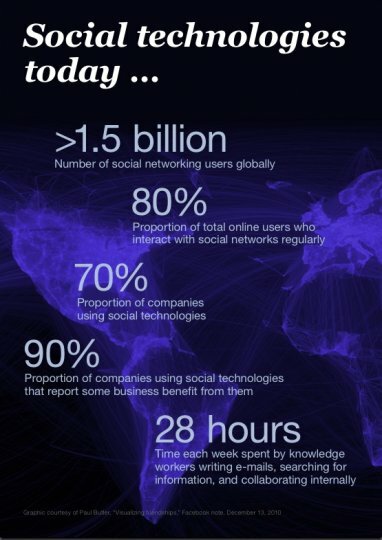 "Today, more than 1.5 billion people around the globe have an account on a social networking site, and almost one in five online hours is spent on social networks— increasingly via mobile devices. By 2011, 72 percent of companies surveyed reported using social technologies in their businesses and 90 percent of those users reported that they are seeing benefits." McKinsey Global heeft een rapport doen verschijnen waarin zij Social Technologies 'disruptive' noemt. "Social technologies have literally changed how millions of people live. People rely on their online social connections—often including friends and associates they have never met in person—for everything from advice on what movie to watch to positive reinforcement for behavior modification (e.g., diet and weight loss). On social media, writers who have never been published and musicians who havenever performed in public are now contributing to blogs and posting videos to YouTube."